Packers running back Eddie Lacy (27) runs with the ball in the fourth quarter against the Dallas Cowboys at AT&T Stadium last Sunday. 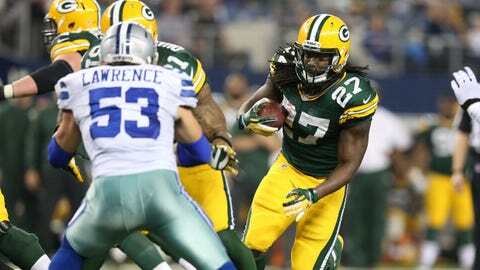 Q: Eddie Lacy is uncrowned Rookie of The Year, you agree? A: Lacy only has one competitor for the NFL’s Offensive Rookie of the Year award: San Diego Chargers wide receiver Keenan Allen. I think that Lacy currently has a slight edge, and it helps that he was named the NFC Offensive Player of the Week for his performance in the win over Dallas. However, Allen is coming off back-to-back two-touchdown games, so he’s hot right now, as well. Q: Given the way Matt Flynn is playing, do you think it’s wise to let Aaron back on the field and risk further injury? I know Aaron really wants to play, but he has admitted that he feels"rusty" whereas Matt is firing on all cylinders now. Q: if rodgers is cleared medically and if he wants to play why not? he has a contract and who knows what else can possibly happen? — Malcolm Bidwell, Casa Grande, Az. Q: Don’t you think that Rodgers should sit for the remaining games of the regular season. And if they make the playoffs then bring him back into the starting line up for the playoffs. Maybe the offensive line will be playing better by then, and the coaches should be better by then also because they will be playing for there jobs. A: I am the cautious type, so it appears that I have that in common with the Packers’ medical staff. The long-term health of Aaron Rodgers should be the franchise’s top concern, and that’s proving to be the case with the way they’ve held him out so far. If he’s medically cleared — which, as of Dec. 18, he’s not been, then let him play. But allowing him to risk further injury to his healing left collarbone would be a mistake, and the team has been wise to take the route they’ve gone. It’s not about Rodgers being rusty and Flynn currently being in a rhythm with the offense. After all, Rodgers is a former NFL MVP who’s in the prime of his career and Flynn has been dropped by three teams in the past calendar year. So the Packers aren’t hesitating because of that. It’s a medical decision and one that, for the sake of the team’s next five-plus years of success, is best to be cautious with. Q: I was ready to call for McCarthy’s head after the terrible play calling in the first half, why can’t he coach to win(like the second half) instead of coaching not to lose, like most games we watch? Q: the pack looked like a new team the 2nd half. was someone else calling the plays ? Q: Why can’t coach call plays every game like he did in the second half Sunday? Make aggressive calls and the players seem to be more aggressive too. A: Here is what Mike McCarthy said Monday: "We had two plans going into the game and the no-huddle just really wasn’t clicking for us. We got back to some basic things (in the second half) and our guys played extremely well." Sometimes, it’s about play calling. Sometimes it’s about players executing what’s called. In most cases, it’s a little bit of both. But in this particular game, I thought it was more so that the players just performed better in the second half. That McCarthy went right to the running game with Lacy to open the third quarter set a tone that helped Green Bay begin its improbable 23-point comeback. When asked whether he was sending a message by running it with Lacy on the first play of the second half (which resulted in a 60-yard gain), McCarthy said: "It was really going back to the basics of how we wanted to run the ball against them. … But really, they overplayed some of our runs and our guys just kept battling. Eddie was outstanding, just the way he ran the football. … I didn’t run any trick plays or any deceptives, didn’t do anything exotic, just wanted to get after them fundamentally and that’s what we did." Q: If the Packers hadn’t had a timeout left after the Packers took the lead, how would the Packers got the replay official to look at the interception before the Cowboys ran another play? A: Well, if the Packers didn’t have a timeout, they probably wouldn’t have had the review. Though the referees ended up not charging Green Bay with a timeout, it sure seemed as if that was the only way for McCarthy to get them to stop the next play from happening. "Well, I think the timing of it worked out, so they were really buzzed about the same time," McCarthy said Monday. "The process, it worked out for us. "I was in communication with the official on the boundary and also the gentlemen that gets the information, that gets the buzz, the confirmation from above. "I’m not going to get beat by a technicality. That was my thought process as soon as we saw it, especially at that point in the game. We were down to, that was it. It looked pretty clean, I know it was on the other side of the field, but it looked clean from our perspective and the communication from the box was that it was clean. Good game management." Q: Why don’t teams have their back up quarterbacks practice with the first squad at least one day of the week? The starter has it down so would it not strengthen the back up? A: That’s a fair question, but mostly it’s because practice time is so limited and practice time is so precious. If Aaron Rodgers isn’t medically cleared, the team doesn’t want to waste its few practice hours on giving him snaps with the starters. How many hours would you guess that the Packers are on the practice field each week during the regular season? The answer is: only about four total hours, give or take a bit. That’s not much time, and to use some of it giving reps to a backup quarterback is just not the best use of that time. Can they stop San Fran or Seattle on the road? Q: Even after an improbable comeback win against the Cowboys this week, the Packers are still in playoff contention. However, the Packers obviously still have huge problems on the defensive side of the football. Everyone seems to call for Capers’ job on a weekly basis. Is this simply a scheme issue? Or is it that Green Bay simply doesn’t have the athletes to adequately match up against the NFL’s better offenses? A: I’ll start with Tom’s question. Well, anything can happen in the playoffs. I’m kidding, Tom, I’m kidding. No, I don’t think the Packers are capable of beating the 49ers or Seahawks on the road in the postseason, but that doesn’t mean that an underdog can’t win. Green Bay wouldn’t be favored in either of those matchups, but that’s why the game isn’t played on paper. The Packers’ defense isn’t great, but it’s not the worst of the past 50 years, Jerry. Believe it or not, they’re ranked fifth in the NFL in sacks this season. Green Bay is also No. 8 in the league in forced fumbles. It can’t be the worst defense over the past half-century with those rankings. That doesn’t excuse their negatives, though. The Packers are 25th in run defense, 22nd in pass defense and 21st in points allowed. That’s why it’s not a Super Bowl-caliber defense right now. To Kurt’s question, it’s rarely just about scheme or just about talent on the field. I believe for Green Bay, it’s a combination of both. There is top-level talent on the defense (Clay Matthews, Sam Shields, Mike Daniels), but there’s also holes (with the safeties being the biggest of them). Dom Capers isn’t without flaws as the defensive coordinator, either. However, good players can make a poor coordinator look like he knows what he’s doing, and vice versa. For the Packers this season, I truly think it’s somewhere in the middle. Q: I still don’t know why they are sticking with Brad Jones and M.D. Jennings on defense? When it is clear that Jamari Lattimore and Sean Richardson cover and play at a higher level when on the field. I wonder if the coaching staff is somewhere else and not paying attention to the game. Otherwise they would see it too. A: I agree, David. From what I’ve seen from Lattimore and Richardson, if I took over the defense right now, I’d play them ahead of Jones and Jennings. I think sometimes coaches fall into a trap of "he’s the starter" and "he’s the backup" and base their playing-time decisions too much on that and not enough on most recent performance. However, it’s also possible that Lattimore (198 snaps this season) and Richardson (102 snaps) benefit from not having their weaknesses exposed as much, because they aren’t playing as often. There’s a lot more film on Jones (574 snaps) and Jennings (752 snaps) for opposing teams to exploit what those players have proven unable to do defensively. Perhaps Lattimore and Richardson would get similarly exposed if asked to play that much. I’d still play Lattimore and Richardson first, but that aforementioned possibility does exist. Q: How can the Packers justify offering Raji 8 million dollars a year for 25 tackles(14 solos). That is $320,000 a tackle. A: Well, I agree that B.J. Raji isn’t playing like an $8 million per year player, but his production can’t be measured in tackles. His main role is to take up blockers at the line of scrimmage, create some push and open up room for the linebackers to make plays. It doesn’t mean that the Packers would mind if Raji showed up in the box score more, but he’s not a player that can be valued by his number of tackles. Q: How close is Randall Cobb from being cleared to play? Do you think it will be this week or next week? With the offseason looming, but not here quite yet, do you think the Packers will address Defense: playmaking linebackers, bigger DB’s for press coverage purposes, or pick up a Big #1 type receiver in the off-season. Will they draft a decent backup QB? A: As I wrote on Wednesday, it appears that Randall Cobb might not return at all in the regular season. If the Packers make the playoffs, that’s probably about the time when he’d get medically cleared. Though, with medical situations, they’re always subject to change quickly. To your other questions, I am very curious to see if the Packers draft a quarterback in the middle rounds. Are they convinced that Matt Flynn should just be Rodgers’ backup for the next five-plus years? Does Flynn accept what appears to be a fact that he just thrives in this offense and that he should just play out his career as the guy behind Rodgers? How does Scott Tolzien figure in? McCarthy is very high on Tolzien’s long-term potential. My guess is that Green Bay will draft a quarterback somewhere around the fourth or fifth round, but doing so essentially boots Flynn out the door. There are many factors involved with this decision. As for the other offseason questions, I think the Packers will feel comfortable re-signing James Jones and drafting a pass-catching tight end. They’re not going to kick all of their defensive backs to the curb and start over with bigger guys, especially when the shortest among them (Sam Shields) is their best one. Re-signing Shields should be one of Ted Thompson’s biggest offseason priorities. Playmaking linebackers? Sure, but they’re set outside with Matthews and Nick Perry, so it’d be more about finding inside linebackers who would then take the spot of either Brad Jones and/or A.J. Hawk, and I’m not sure that Thompson wants to do that. ** Thanks for the questions this week. We’ll do it again a week from now to break down the Packers-Steelers game and look ahead to the regular-season finale between the Packers and Bears.